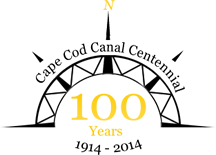 Celebrating 375 years of incorporation, Sandwich is where Cape Cod begins. Settled in 1637, incorporated in 1639, it is the oldest town on Cape Cod. Sandwich is located on both sides of the Cape Cod Canal (which celebrated its 100th anniversary in 2014 ). Sandwich’s dynamic community both loves and embraces the town’s rich culture, proud heritage and pristine beauty. Visit Sandwich 375th Celebration Website. A canal linking Cape Cod to Buzzards Bay had been contemplated since the earliest days of the Plymouth Colony, but the first real attempt to dig a canal did not take place until 1880 – at least until the 400-plus Italian immigrants, deprived of food and compensation, descended on Sandwich Village to demand satisfaction! Thus started . . .
A fascinating and beautifully done film on the history of the canal. Nye descendant who now lives in the Sonoran Desert.